My first foray into cycle camping was a mixed experience: a week of scorching weather, fine company and challenging terrain followed by the twin insults of biblical weather and a stupid crash. Mix in a heroic rescue and a comic British Rail cameo and it sounds a story worth retelling one day. Caersws plays a minor role, a tiny settlement close to the route of the Plains 300 Audax: site of our dishevelled rail-transported return to London. Having arrived by bike, crossing into Wales via the Forest of Dean and having traversed Wales via Brecon, returning by train felt quite deflating. Not that we could have been much more punctured by fate. 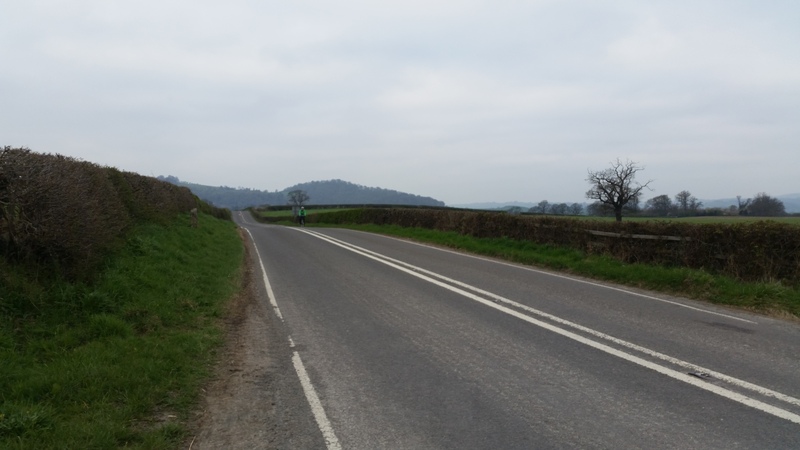 The Plains 300 Audax only just penetrates the Welsh border in Powys, but there is a palpable sense of shifting culture and terrain even on the road into Newtown. The control at the BP Garage is hardly representative of any kind of Welshness, yet the distant view of hills (or mountains) as I made the crossing excited my confused atavistic nationalism, a sense of belonging that I mistrust yet cannot escape. I consider myself a citizen of Europe more than a British subject, yet any mention of Wales recalls my father, and the Land of My Fathers. He’s the only person I have watched dying, and my view of Wales is coloured by his unquestioning national pride, confused as it was by his time in the British Army and his disdain for extremist Welsh nationalism. My only trip to Wales with him was a week on my early teens to revisit old friends and places, a trip which even now fills me with lost and false memories, and regret. We had a great time together, and I wish time was less of an eraser. My cycle touring encounter with disaster, charity, humour and heroism was over 20 years ago, shared with a fellow cyclist with whom who I had many formative adventures: he and I rode fixed together, rode from London to Brighton on a vintage French tandem. Our trip to Wales involved illegal camping on the grounds of the BBC Training Centre in Evesham, watching Universal Soldier in the cinema, and camping in Brecon, where my grandfather has plaque in the Cathedral (as does my father now). Now I cannot think of Brecon without reference to my partner and then newborn son, who travelled with me to hear the sounds of Bruckner at the ceremony where his name was added. Then, it was the memory of visiting with my father that resonated. And what did the organiser of the Plains 300 say to me as I collected my brevet card: “Hebden Bridge, well someone has to live there.” My ride into Wales and back only took about 16 hours this time, and I stayed upright and dry. Great route, good company at times and two surreal stops at Dinky’s Diner made it rather less dramatic but also kept me from vanishing into solo nostalgia. This entry was posted in audax, cycling, love, memories, psychology, randonneur by spandelles. Bookmark the permalink.